The much-anticipated Apple Watch began taking pre-orders and in-store personalized fittings last Friday , and our team at Speck couldn’t be more excited. On launch day alone, the new device raked in as many as one million preorders, according to Forbes. While we’ve seen a slew of groundbreaking fitness apps specifically tailored to Apple’s new smartwatch, as well as reviews on how Apple Watch can up your fitness ante with a built–in heart rate monitor, GPS, and accelerometer – Speck set out to create the best Apple Watch accessory to supplement your fitness goals. Meet CandyShell Fit for Apple Watch. Its dual-layer construction derives from our award-winning, best-selling CandyShell design to protect your Apple Watch from shock and impact. Its easy on-and-off application allows you to put on and remove CandyShell Fit quickly, so you won’t miss a beat. Plus, a raised bezel surrounds the perimeter of your Apple Watch’s screen to guard against damage to its ion-x glass. CandyShell Fit has been tailored to match the bands of your Apple Watch Sport, to give you protection that’s liberating and stylish. Put on CandyShell Fit so you can go throughout your day more boldly, with reinforced protection that doubles the possibilities of your day. Go one step further, knowing that your Apple Watch will be guarded from everyday bumps and collisions. 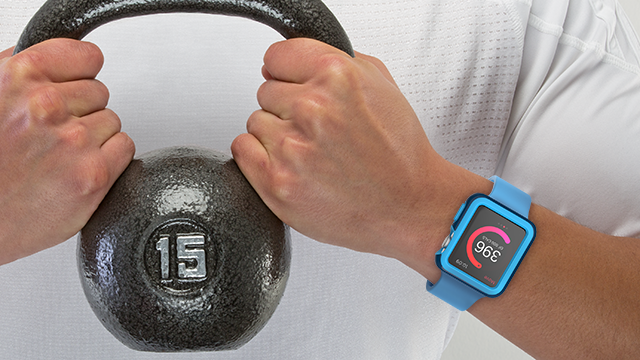 Now you can track your fitness in rough and rugged conditions, whether that may mean pumping iron at crossfit, scaling walls in rock climbing, or cycling for miles without fear of damaging your new favorite Apple device. Speck lets you work hard, and play harder, with CandyShell Fit. CandyShell Fit will be available for Apple Watch, Apple Watch Sport, and Apple Watch Edition in both of the watch’s 38mm and 42mm sizes. Sign up today to be the first to hear news and updates on availability for our new Apple Watch accessory.